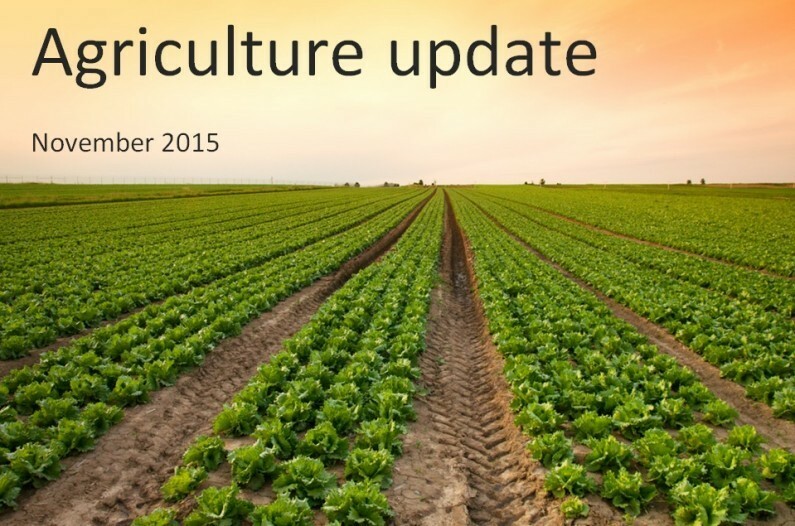 Welcome to our third agriculture update for UK farmers. The Chancellor, George Osborne, last week delivered his 2015 Autumn Statement. The Autumn Statement did not bring much news for the agriculture sector, however, there was an important announcement regarding DEFRA. We have prepared an agriculture Autumn Statement 2015 review here. Although an increase in output (milk production from April to mid-October 2015 had grown to 732m litres above the long-term average) has resulted in increased dairy price competition, the ongoing supermarket price wars, in particular, have left many dairy farmers on the brink of closing. Dairy producers are now receiving just 60-70% of break-even milk price of 28-30p per litre and, according to The Dairy Group, are facing a total loss of 4.1p per litre in 2015/16. The NFU Horticulture and Potato Board have also reported that supermarket price wars are pushing UK vegetable and fruit growers to cut production whilst imports reach record levels. The value of UK field vegetable production fell 14% between 2010 and 2014 and outdoor cropped areas fell by 7,000ha. The volume of imported fruit and vegetables to the UK increased by 664,000t between the same dates. A funding pot of £24m is available through Local Enterprise Partnerships for business development, food processing and small-scale tourism initiatives. Grants of £35k to £140k are available. One new job is required per £30k of grant. The RPA has said it remains on track to make full BPS payments as early as possible in the payment window with the “majority before the end of December and the vast by the end of January 2016”. HM Government is facing a legal challenge over changes to Feed in Tariffs (FITS). A DECC spokesman said a pre-action protocol letter had been received. In England 30,000 farmers (35%) are expected to receive it (Basic Payment Scheme) in their bank accounts by 1 December. A further 15% are then to be paid by the end of December and the final 50% by the end of January. Those not expecting to be paid by January should be written to. HMRC has confirmed that Renewable Heat Incentives (RHI) payments on a domestic scheme are tax exempt where part of the heat is for non-domestic purposes e.g. home office or workshop. DEFRA’s 25-year Food and Farming Plan is being drawn-up by ministers and industry representatives and will be published next year. DEFRA, however, appears to have agreed a reduction in its budget ahead of the comprehensive spending review. A budget reduction of 8% over the next four years is expected. Three of the UK’s environmental bodies have launched legal action against DEFRA, accusing the government of failing to protect rivers and wetlands from agricultural pollution. Pig farmers share of the retail price of pork has fallen to 34%, the lowest level for 11 years. Farmgate prices are 16% lower than October 2014. A leaked letter obtained by the Ecologist magazine from Amber Rudd, Energy Secretary, has said that the UK is likely to miss its renewable energy target of 15% by 2020. 11.5% is the current estimate according to the leaked letter. The annual Game Fair will be held in 2016 at Ragely Hall, Warwickshire, after new backers were found. Sugar beet quotas will come to an end in 2017 and growers are being asked to consider pricing options. Options may include 1) an annual price negotiation in advance, set 9 months before planting (the current position) 2) a market derived price link under which growers could benefit from changes in world sugar prices with perhaps an agreed minimum 3) pricing determined under longer contracts than one season, offering growers more stability.